After several decades in Bridgeport, a long-standing business will soon be no more. During a lengthy Bridgeport City Council meeting Monday, quick approval was given to make a purchase of almost $1 million for the building that houses the business and the 2.734 acres that come with it. The city’s governing body gave unanimous approval to purchase the property that is home to the Towne House Motor Lodge that sits on U.S Route 50 near Twin Oaks. Bridgeport Mayor Andy Lang said recently the city will pay $975,000 for the property. As for the transfer of the property from private to public ownership, it will come soon. Bridgeport City Attorney Dean Ramsey said the closing has to take place by April 25. No one believed that would be a problem. The business will likely be closed prior to that date. During City Manager Kim Haws’ report to Council he said the Towne House will cease operations soon. “They will be closing their doors within the next two weeks,” said Haws. 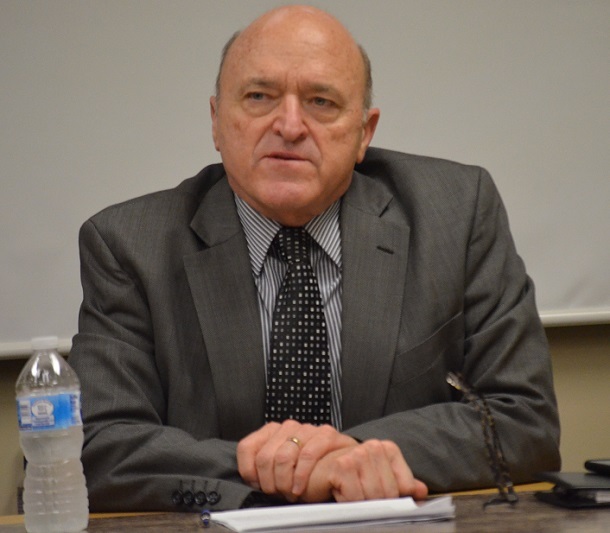 Haws said the dollars are available through Bridgeport’s capital reserve fund. Council, he said, has appropriated the dollars from that fund to make the purchase. The cost does not include demolishing the structure. That, said Haws, will be next and it will be soon. “I’d like to see work initiated soon, and it will take some time for mobilization of equipment, but I’d like to see the building down within May to a May 15 date to see things start coming down. At a minimum, we’d like to see some abatement activity,” said Haws. Lang said property with not only frontage, but with a lot of that size that is deep is a very rare commodity on Main Street. What the city will do with it has not yet been determined, although there has been discussion of locating a potential new fire department to replace the Main Street station and a new police department building to ease congestion with space at the Bridgeport Municipal Complex. Both, a combination, or perhaps neither will go there, Lang has said. Council took no action on an agenda item that would have approved a contract with Solid Rock Excavating for $24,500 to help prepare property acquired by the city last year along Route 131 for site development. Haws said some “intricacies” had arisen but didn’t specify what they were other than to ask for the contract to be postponed “indefinitely until they can be reviewed.” The city began looking to acquire the property as far back as May of 2014. The land in question is the roughly five acres situated on the opposite side of the Rec Complex’s entrance on Route 131. In February of 2018, the city was able to maneuver through a multitude of FAA bureaucratic hoops (the FAA funded the original purchase of the land) and acquired it for $264,000. The property had old silos and several other dysfunctional buildings along with scrap material on it. The airport, outside of rental car companies using a building as a wash bay, had little use for the land. The city, however, did have needs for the land. Along with that, city officials talked about the property as blighted and an eyesore for those visiting the city for events at the Recreation Complex. The led the city, with help from the Airport Authority, to make the deal last year. Since that time, the site has had the scrap material removed and most of the buildings, including the silos, demolished. Council also heard a 15-minute presentation from Joe Rubisch of Cityworks, which is a software company that would like to work with the city’s GIS system. The presentation showed a number of ways the city would track everything from works orders to inspections to receiving complaints and concerns from residents and allowing the city to address them and show progress being made on concerns. No action was taken on the matter as it was not listed on the agenda other than for a presentation. Heard from Bridgeport Parks and Recreation Director Joe Shuttleworth who provided his annual department report. Each year, each department head breaks down things accomplished, things ongoing and things planned to the city’s governing body. More on Shuttleworth’s report later in on Connect-Bridgeport. Appointed local architect of Jim Christie of Civil Environmental Consultants to the Bridgeport Development Authority. The term is for three years. Approved a contact from United Sound & Electronics, LLC for $8,451. The contract is to upgrade audio-visual capabilities in two large meeting rooms at the Benedum Civic Center. Approved a contract for sidewalk placement design at Crestview Terrace. The Thrasher Group will handle the project for $15,000. The cost includes survey work, field layout, and possible alignment adjustments to sewer/storm lines. 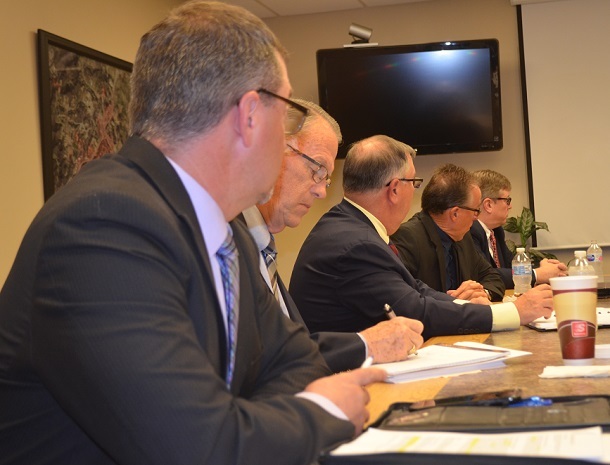 Editor's Note: Top photo shows City Manager Kim Haws addressing Council during the work session Monday, while members of Council are shown listening to Haws in the second photo. 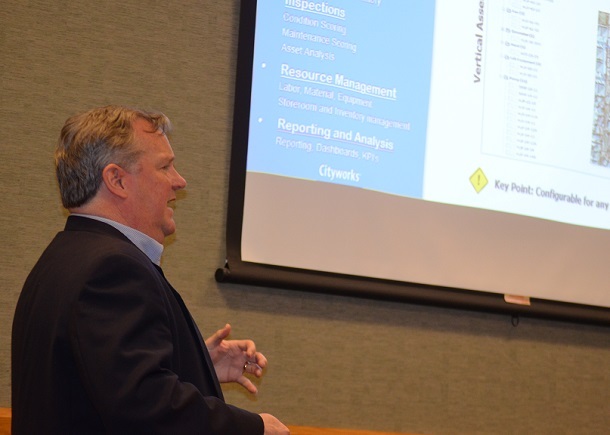 Below is a photo of Joe Rubisch of Cityworks during his presentation to Council.